PRO-MIX BX BIOFUNGICIDE™+MYCORRHIZAE™ is a general purpose peat-based professional growing medium suitable for a wide variety of horticultural plants and transplanting applications. PRO-MIX HP BIOFUNGICIDE™+MYCORRHIZAE™ is a high porosity peat-based growing medium, ideal for water sensitive crops, rooting cutting and/or low-light growing conditions. PRO-MIX® MP ORGANIK MYCORRHIZAE™ is an approved-organic, multi-purpose growing medium that contains a mycorrhizal inoculum (Glomus intraradices). PRO-MIX BX BIOFUNGICIDE™ is a general purpose peat-based growing medium compatible with a wide variety of ornamental plant species, fruit crops and most vegetable transplants that has been enriched with a biofungicide (Bacillus Subtilis) that prevents root diseases. PRO-MIX HP BIOFUNGICIDE™ is a high porosity peat-based growing medium that has been enriched with a biofungicide (Bacillus Subtilis) that prevents root diseases. This growing medium ensures optimum growth, especially when high air capacity and extra drainage are required. PRO-MIX HP-CC MYCORRHIZAE™ is a lightweight, high-porosity peat-based growing medium that contains chunk coir. It ensures optimum growth, especially when high air capacity and extra drainage are required. It is ideal for water-sensitive crops, rooting cuttings and/or low-light growing conditions. PRO-MIX BX MYCORRHIZAE™ is a general purpose peat based professional growing media designed for a wide range of greenhouse and transplanting applications that contains a mycorrhizal inoculum (Glomus intraradices). PRO-MIX HP MYCORRHIZAE™ is a high porosity peat-based growing medium ideal for water sensitive crops, rooting cutting and/or low-light growing conditions that contains a beneficial mycorrhizal inoculum (Glomus intraradices). 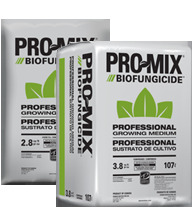 PRO-MIX PGX BIOFUNGICIDE™ is a plug and germination peat-based growing medium specially made to work with plug systems and automated seedling production that has been enriched with a biofungicide (Bacillus Subtilis) that prevents root diseases.